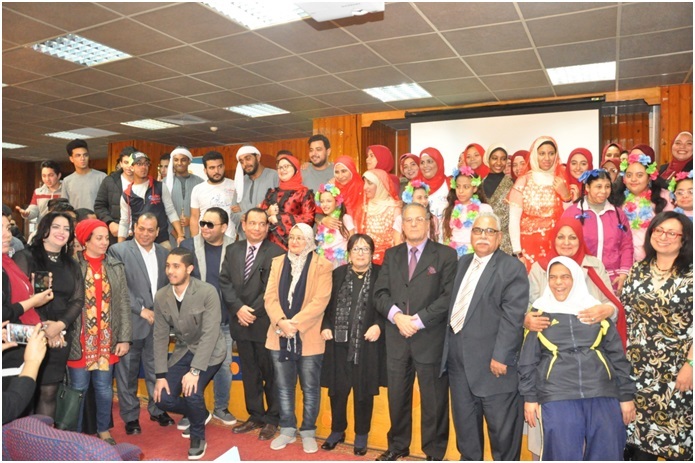 The Department of Special Education at the Faculty of Education headed by Dr. Fatma Barakat has organized its third festival in a row entitled "Capable with Difference" in celebration of the lives of persons of special abilities. The event took place on Dec 12,2018 and was made possible by the relentless support of the Dean Prof. Dr. Salah El Din Khader, the organizing effort of Dr. Mohsen El-Naggar event coordinator and leader of student Group"Habibty ya Misr." It is worthy to note that Dr. Mohsen is a lecturer in the department. The event was very well attended. Among the guests are Prof. Dr. Mousa Ibrahim Mousa -Vice President of O6U for Social and Environmental Affairs who addressed the audience in a little talk demonstrating his interest in support of those with special abilities. Dr. Alla El- Naggar, Vice- Dean for Social and Environmental Affairs welcomed members of the audience and along with Dr. Sally Michael Hanna, Vice- Dean for Education and Student Affairs who gave a talk outlining the university vision that supported persons with special abilities since its establishment. Dr. Nevine El- Qabag, Deputy minister for Social Solidarity gave a long talk demonstrating the government's continued dedication to the cause of supporting those with special needs. Dr. Hala Abdel Salam a minister of education consultant also spoke to the audience about schools for students with special abilities. She focused on the role of the government in supporting such schools. Actress Samira Abdel Aziz and Actor Ahmed Rizk were among those invited. Students of special abilities from Misr Language School and Resala have contributed creative shows that involved singing and choreography which left the audience in awe of the many talents that were surprisingly prolific. The festival proved highly successful as always.